in the Class AA three-point showdown. With a combination of the splash of the net after his shot, grit of his teeth on defense and hours of hard work put into his game, Bloomington guard Brandon Holtz is the ideal high school player. Or, so says his coach Ron Rose. "He's a high school coach's dream," Rose said. "He's the first one to practice and the last to leave; nobody works harder. He has great balance, quick release and great bounce, which is what you notice on all great shooters. You're almost surprised when it doesn't go in." "I'm going to go at you on the basketball court." 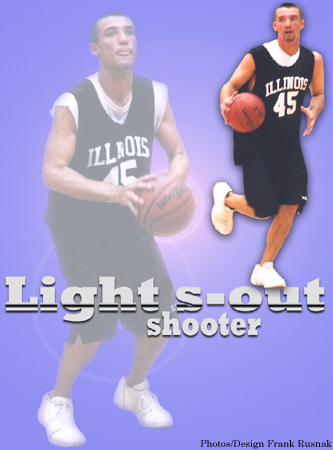 A four-year varsity player, Holtz established himself as one of the state's finest shooters. Advancing to Peoria to shoot in the finals, he finished third in the state's Class AA three-point showdown. Holtz's performance at the Peoria Civic Center -- home court of Bradley -- was only the start of what he'll be displaying there for four years to come when he competes in the Missouri Valley Conference against Bradley's rival, Illinois State. "I know I can shoot it and I work hard," Holtz said. "I'm going to go at you on the basketball court. It's a great opportunity at Illinois State. Their three top guards are all leaving." ISU's three-guard starting lineup of seniors Vince Greene, Trey Guidry and Gregg Alexander are all graduating, leaving an opening for Holtz and Bloomington teammate Dodie Dunson to make their presence felt. Longtime teammates, Holtz and Dunson, both will take their backcourt act to ISU in hopes of having more postseason success than what they had with Bloomington. This season ended just as last, with a disappointing bow out early in the playoffs. The Purple Raiders began the last two years with high expectations, a bevy of talent and all the materials to make a deep run in the playoffs. Despite returning 12 of their 14 players this season, it wasn't meant to be. With his backcourt buddy, Dunson, there to assist him, Holtz ended the season averaging 20 points, five rebounds and four assists. "He always competes and he's ready for the ball all the time," Dunson said. Before they take off to ISU, Holtz and Dunson will take part in the June 25 Illinois Basketball Coaches Association (IBCA) All-Star Game at nearby Illinois Wesleyan's Shirk Center.